Justice Bishop is a player that has football on his mind 24 hours a day, 365 days a year. 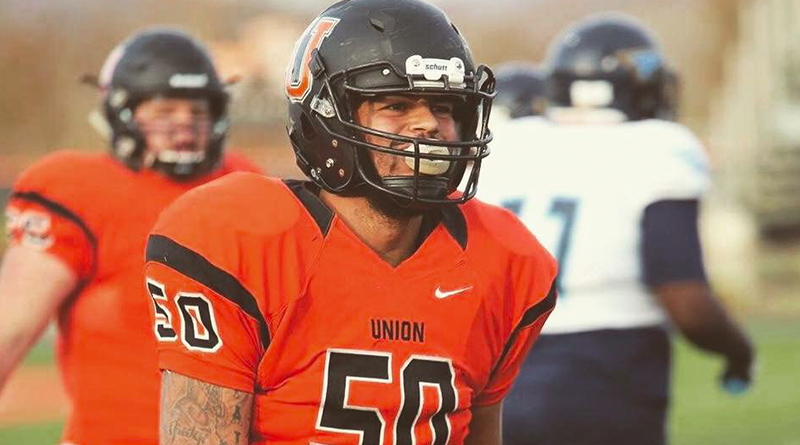 The soon to be Senior Defensive End at Union College, an NAIA program in Barbourville, Kentucky, feels this mindset is what he needs to succeed. Last season, Bishop had a breakout year in his first full season as a starter. He finished with 68 tackles, 9.5 tackles for a loss for 74.7 yards, 5 sacks for 40.7 yards, 1 interception for 27 yards, 1 forced fumble, 1 fumble recovery, and 2 pass deflections. Bishop was extremely satisfied with his performance, but feels like there is always a part of his game to better. Overall, he led the Bulldogs in many defensive categories, but this year wants to do even more to help his team win more games this season. Bishop’s success did not just come naturally, it took hard work and dedication. Now, to have an even better statistical season this year, he has been working in the film and weight rooms religiously. In the film room, he studiously watches film from his Junior season to see where he needs improvement, so he can make the proper corrections on the field. In the weight room, he been training with an elite performance company, Sipple Performance, and also does one on one sessions with Union’s strength and conditioning coach. He adds training sessions in with local trainers that specialize in Defensive Line training, teaching him skills to enhance his hand movements and pass rush moves. Bishop is doing all the little things right, focusing on the skills needed to make plays. On the field, Bishop prides himself on his versatility, rather than one skill set. He feels he stands out as a pass rusher and a run stopper using his quickness, get-off speed, football IQ, and his ability to get off blocks as the main attributes to his game. He is a player that studies film religiously, a vocal leader, a high-motor player, an aggressive play-maker, and a player that will do whatever it takes for his team to win. Every player has goals going into a season, and this is no different with Bishop. However, Bishop’s goals are team first and individual second. As a team, he wants to lead Union to a winning record, a conference championship, and a playoff berth. Individually, he wants to lead the Bulldogs in tackles, tackles for a loss, and sacks. He also wants to make and impact on the national level and become All-Conference and All-American. Bishop believes that he is one of the best small school players in the country and an athletic pass rusher that is an every down defensive end. Justice Bishop is surely a prospect to keep an eye on this season.